Jim Clifford Moving Services was incorporated in November of 1989 and since then has become one of the largest movers in the Toronto area that specializes in the relocation of offices, libraries and plants. Prior to 1989 the founder of the company, James Clifford, was involved in the managing of Clifford Van & Storage Ltd. Which was started by his grandfather, John Clifford and his father, James Clifford Sr., in 1938 and was a extremely well known company until it was sold in 1986. The company is now managed by James Clifford and family. The following is a list of key personnel who would be able to help coordinate and supervise your moves. As well as the above list, we also have a full complement of drivers, movers, packers and systems installers. 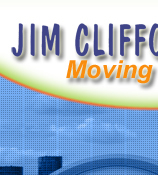 Jim Clifford Moving Services Inc. is a mover that does not do household moves. We only move offices, plants, libraries, hospitals and other specialized goods. Our personnel is trained and experienced in this area only. We do not have them switching back and forth between this and household moves. These are two extremely different types of moves. Serving people by organizing the Perfect Move through superior performance and support. Our head office is located in Pickering at 1885 Clements Rd, where we also operate a modern storage facility. Our employees are prepared to work other than regular working hours. ie. Evenings and weekends. We have a large pool of regular employees which has enabled us to provide crews of up to 30 men. These crews are non-union. We are available to receive orders and correspondence by telephone 416-293-1234, 905-427-0007, fax 905-427-0094 and email clifmove@pathcom.com or cindy@jimcliffordmoving.com . I just wanted to let you know that Clifford Moving were fantastic!! They met deadlines, worked hard, did not complain, and showed initiative. Jim Clifford even showed up to lend a hand. I never got a chance to email you! The moves are over and everyone is pleased and happy as can be. I want to thank you and the guys again for all there hard work and making sure everything ran smoothly. Once again Jamie did a swell job and is amazing as always. There was lots of positive feedback from our staff and Profs. Just a note to Thank you and your moving crew for their professionalism and hard work during our library’s move to the new facility. Having movers experienced in moving libraries made what could have been a very difficult task a much smoother and easier process. I want to express our appreciation for the excellent job your company did on our recent move. Cindy was a pleasure to deal with. Her positive, enthusiastic attitude and her professionalism reduced our stress levels greatly. We were all amazed when your crew arrived on site. They were organized and very efficient. Everyone involved was well mannered, extremely helpful, and professional, and they all brought a good sense of humour to the move. If I ever have the opportunity to recommend a moving company in future, I will highly recommend Clifford Moving Services.